With the American Originals Natural Oak 3/4 inch x 3-1/4 inch Solid Hardwood Flooring you can enjoy the natural beauty of oak's rich, robust grain characteristics throughout your home. The planks have micro edges and square ends for a classic, linear look. It has the Bruce DuraShield finish for durability and beauty. Hard Maple Tuscany 3/4-inch Thick x 3 1/4-inch W Hardwood Flooring (20 sq. ft. / case) Dubeau Floors solid hardwood floors are made in Canada. Solid Hardwood flooring provides a solid thickness that makes the floor stable, durable and long lasting. 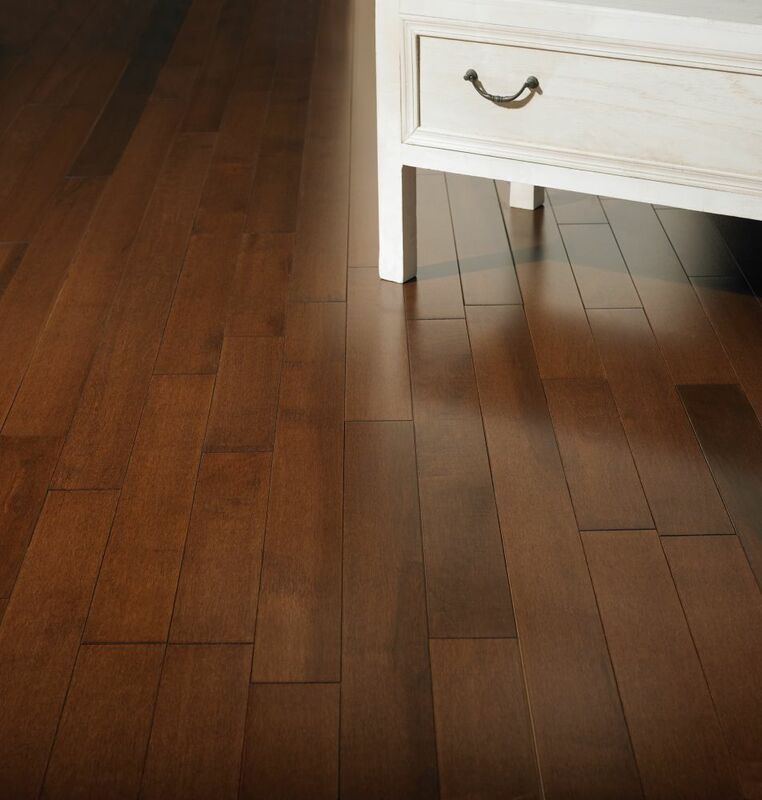 Hard Maple Tuscany, featuring a close grain and a rich brown-tone, adds warmth and a touch of elegance to any contemporary living space. Hard Maple Tuscany 3/4-inch Thick x 3 1/4-inch W Hardwood Flooring (20 sq. ft. / case) is rated 2.3 out of 5 by 6. Rated 1 out of 5 by Cathy from Terrible flooring I would absolutely NOT recommend this flooring. For a number of months after it was down, cracks appeared in numerous boards. It also marks and dents extremely easily. Impossible to keep looking clean, everything shows. Water penetrates far too easily. For the cost of this flooring I expected better. Rated 3 out of 5 by Glenbob from Very straight! I have purchased about 1600 said ft of this, so I am happy with the straigh pieces, but one complaint I have, is there are away to many 18" and under pieces. Rated 4 out of 5 by rld543 from Looks good but cracks Good price for solid maple flooring and looks good installed. I noticed another reviewer mentioned cracks that formed in the planks once installed. I found the same thing. I discarded a few planks with subtle cracks in the finished surface before installation but have seen several new cracks now in the installed flooring a month later. I let my flooring acclimate for a month in the house before installing and I did the job in August when there is lots of humidity so I don't think dehydration is the problem. I've installed hardwood floors before and not had this issue. Fortunately it's not obvious if you're not looking for it so I'm still happy with the floor as long as it doesn't get worse. Rated 4 out of 5 by Bleem from Looks great Looks great, really love the different variations in the wood. Only reason we didn't give 5 stars is because multiple pieces have developed cracks throughout the wood. (Yes we know how to install carpenter for 25years). It's not a huge deal as the wood has a bit of a distressed look to it anyways but shouldn't be happening 2 weeks after install.